The quiet Hungarian village of Holloko became the first village in the world placed in the UNESCO World Heritage List: so carefully have they preserved the old peasant way of life here. Most houses here are wattle and daub, and the people still practice their ancient crafts, one of which is production of original national costumes. 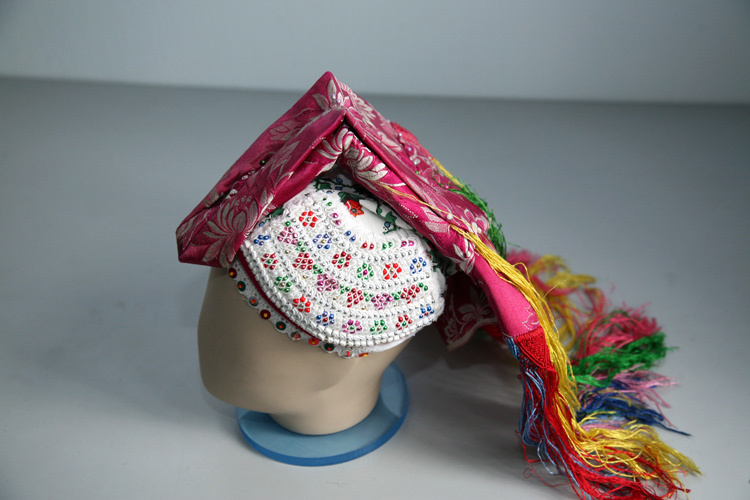 The headdress, the name of which I have not yet found out, consists of three elements: thick white skullcap, ribbons adorning its top and a shawl of amazing angular shape that is worn on the forehead covering the entire head down to the neck, ending with colorful ribbons. In any case, we asked the old lady who sold us his headdress to show how it is worn (pictured) and it turned out that you would need ten pins to keep on the head.